The next step would be synthesis of the data collected. Analyzing the information by grouping and compartmentalizing it to figure out what is most important to the user, most relevant to the business goals, and how it could effects the outcomes of the project. A visual way of placing similar or related pieces of information into groups in order to facilitate analysis. It aids the process of making connections between data that was collected through a variety of sources. The goal is to interpret the groups into trends in the data. A way to create simple character sketches and visual representations of the most important categories of user you are designing for. 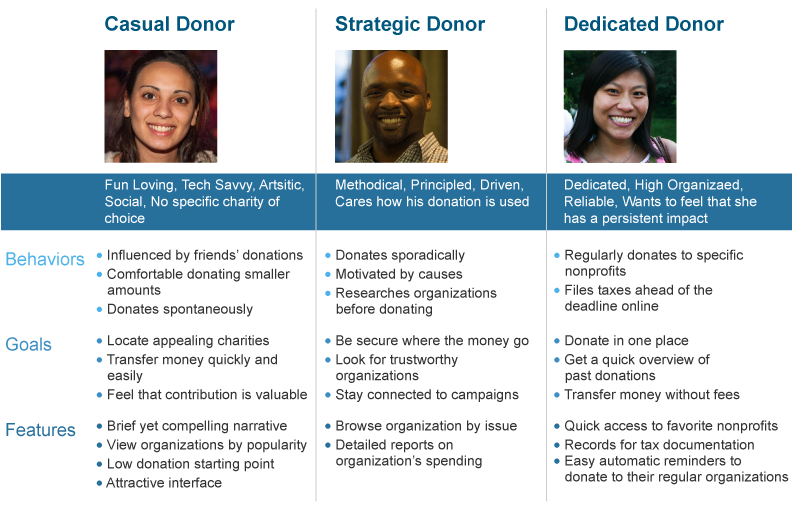 Personas were developed to aid the decision making. They can also help justify innovations to stakeholders in the project. The creation of a representative user based on available data and user interviews. Though the personal details of the persona may be fiction, the information used to create the user type is not. 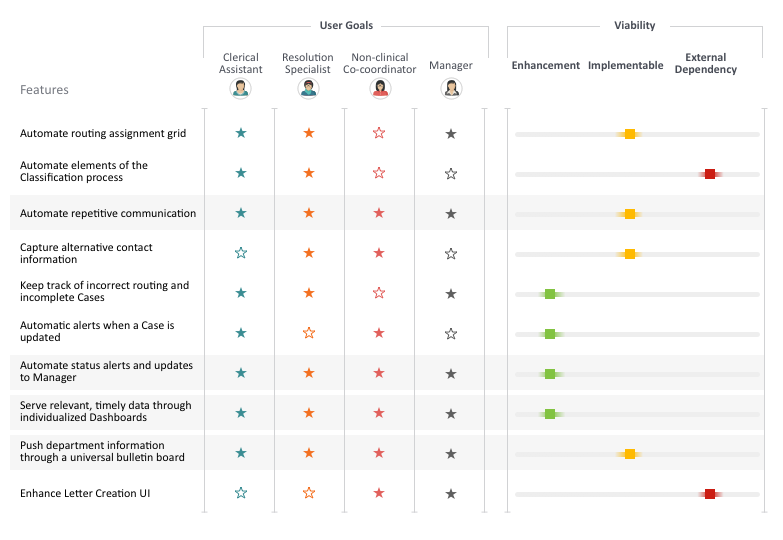 The User Findings allowed us to identify how each user group worked, their priorities and pain points. Based on the results that we gathered, the identified three types of users emerge. Determining which stakeholder would benefit from the feature; does it fit business goals, technical requirement, and user goals? Aligning the findings from all of the research done and brainstorming features that would address each point. Then ranking the need for each feature by "Must Have, Should Have, Could Have, Won't Have". The features to focus on were based on how much the feature would help to fulfill user goals and how viable each feature would be to implement. 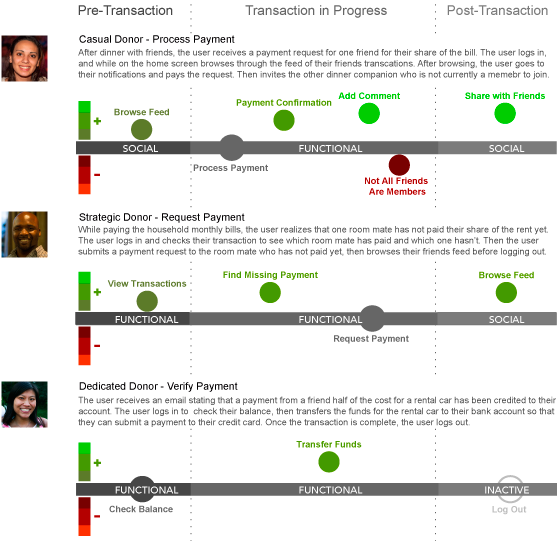 The features were prioritized based on how well they aligned with user goals and how viable they were to implement. A basic description of an action or a goal that the user wants to accomplish by using the product. It is a way to focus on the users thought process, requirements and needs. A description of how users use a particular feature. A look at the steps that the users takes to accomplish their task. The purpose of the use oase is to identify, clarify, and organize system requirements. Use case is a list of actions or events, that are significant to the user in a specific environment to achieve a business or user goal. The user stories served as a base for the use cases. The process helped to uncover any stumbling blocks that might be encountered. 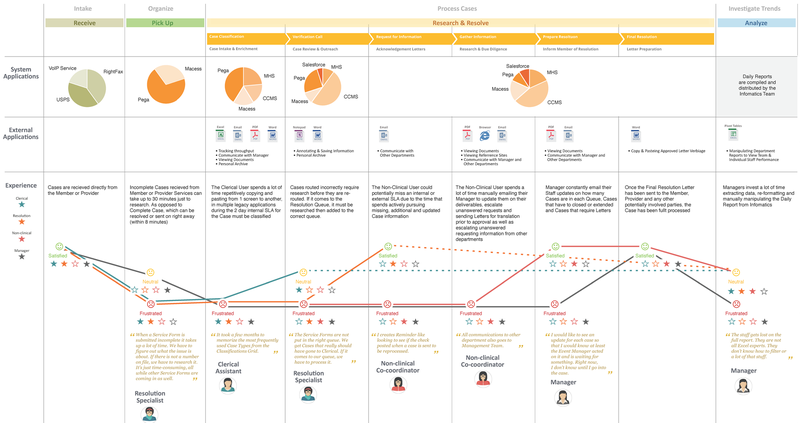 View the User Stories and Use Cases followed by the annotated wireframes for their related taskflows. A collection of emotions plotted against various points in a specific task flow. A visual representation to see which parts of the experience provide pleasure to the user and what the parts are pain points for the user. 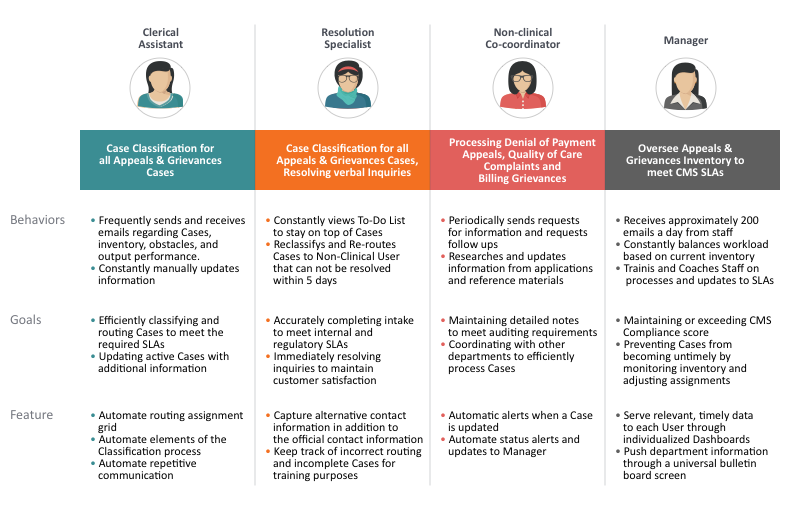 Based on the user research, the pain points of each user groups were mapped against the case processing stages. The pain points often corresponded to the stages where the user had to interact with the most systems and utilized the most external tools in order to complete their tasks. 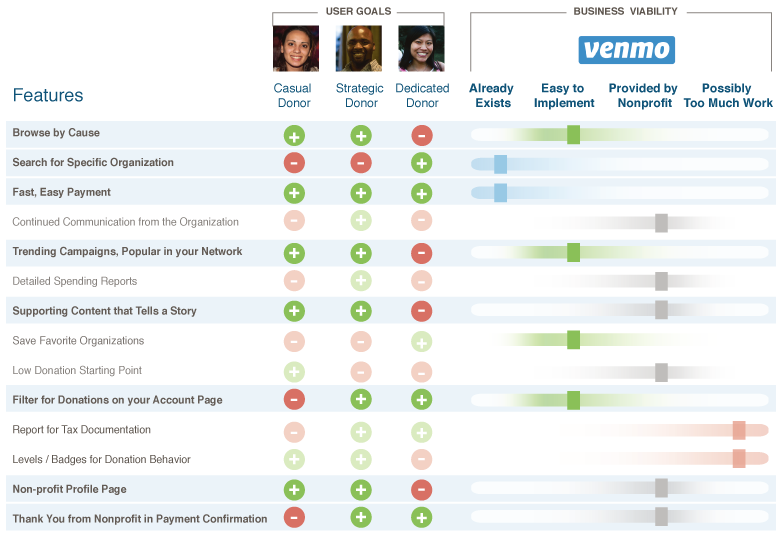 Based on out interviews, user who currently used Venmo did not have many pain points. We crafted a journey map to plot the context that the various users might interact with the app. We wanted to get a view of when each type of user might interacted with the app for social or entertainment purposes.